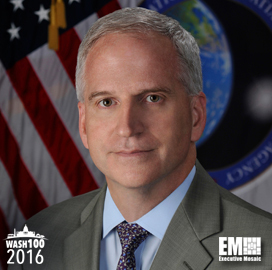 Executive Mosaic is pleased to introduce Robert Cardillo, director of the National Geospatial-Intelligence Agency, for the second consecutive year, as an inductee into the 2016 edition of the Wash100 — Executive Mosaic’s annual selection of influential leaders in the government contracting arena. In October 2015, NGA released a new roadmap titled Commercial GEOINT Strategy that seeks to adopt agile acquisition processes and leverage analytics in order to facilitate the deployment of commercial GEOINT products and services. “NGA will strengthen its partnerships with innovators to explore new ways to access, analyze and evaluate data in support of diverse customer needs,” Cardillo said of the new strategy. He mentioned in a recent interview that the agency would prioritize workforce development and geospatial intelligence services in an effort to improve national security. Cardillo also stated that one of his objectives is to drive innovation and enhance transparency at NGA. He has led the agency since October 2014 and prior to that spent four years as the first intelligence integration deputy director at the Office of the Director of National Iintelligence. Cardillo is also a former deputy director at the Defense Intelligence Agency.